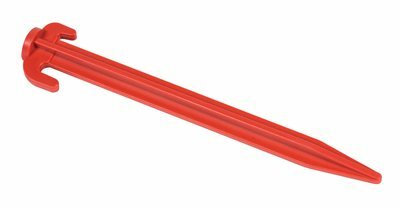 The Kampa Plastic Peg is designed for intermediate ground types, the plastic peg is similar in design to most tent pegs supplied as standard with most types of tents. Taking spare tent pegs on any type of camping trip is essential just in case any get bent out of shape whilst trying to erect your tent . Individual - 19cm / 7.5"
Pack of 10 - 19cm / 7.5"
Individual - 29cm / 11.5"
Pack of 10 - 29cm / 11.5"